James Thornton Harris is an independent historian and a regular contributor to the History News Network. For more information see www.JamesThorntonHarris.com. If you asked the average American to name a CIA agent, he or she would probably go blank. One might list one of the Watergate burglars: E. Howard Hunt, James McCord or Gordon Liddy. A few new junkies might be able to name the current CIA Director, Dan Coats or his predecessor, Mike Pompeo (now secretary of state). Almost no one, however, would be able to identify James Jesus Angleton, despite his key role as leader of the agency’s head of counter-intelligence (CI) operations during the height of the Cold War. Angleton had a profound impact on the agency’s operating procedures during its formative years. A fervent anti-Communist, he was obsessed by the KGB and (he falsely believed) its constant attempts to plant agents in the CIA. Operating without hard evidence, he wrongly accused many CIA colleagues of disloyalty and ruined dozens of careers. The Ghost, a new biography of Angleton by Jefferson Morley, a Washington journalist, provides an intriguing look at this powerful, enigmatic Cold Warrior. He earned the nickname “the Ghost” because he was rarely seen outside his high-security office, yet had a major impact on the agency’s strategy and tactics. 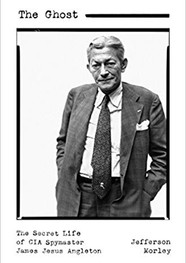 James Jesus Angleton was born in Idaho in 1917. He grew up in a secure, middle-class family. His father was a successful businessman who owned the National Cash Register franchise in Italy. Angleton spent several years in Europe and became fluent in Italian and German. As a student at Yale, he founded a literary magazine, Furioso, which published a number of avant-garde poets including William Carlos Williams, E.E. Cummings, and Ezra Pound. He joined the U.S. Army in 1943 and was quickly assigned to the CIA’s forerunner, the Office of Strategic Services (OSS). (His father, then living in Italy, was already in the secret organization). Angleton rose quickly, by the end of the war he was head of the OSS’ X-2 division (counter-intelligence) for Italy. During the war, Angleton organized a number of secret missions and helped to round-up hundreds of enemy agents. He built a reputation as a genius who could interpret enemy strategies and discern the true loyalties of individuals. Angleton came to believe that the KGB had mounted a massive disinformation campaign designed to mislead the Western allies. As Angleton saw it, the split between Khrushchev and Mao, which culminated in the Soviet Union suspending all aid to China in 1961, was a carefully orchestrated deception – a ploy to persuade the West to lower its guard. He relentlessly pursued nonexistent KGB “moles” whom he believed operated at high levels in the governments of the U.S. and its allies. At various times, he falsely labeled as KGB operatives important figures such as Averell Harriman, U.S. Ambassador to Russia and former New York governor and two prime ministers, Harold Wilson of Great Britain and Lester Pearson of Canada. He also ruined the careers of more than a dozen loyal CIA executives by accusing them, without any firm evidence, of working for the Soviets. Because many of these men spoke Russian or had worked in the U.S. embassy in Moscow, their forced retirement critically weakened the CIA’s ability to collect intelligence on the Soviet Union. Angleton’s obsession with uncovering spies in American led him to authorize one of the CIA’s first domestic spying operations, Operation Lingual. Beginning in 1955, all U.S. mail sent to and received from the Soviet Union was opened and copied at a secret facility just outside JFK Airport. This operation was never disclosed to Congress and the FBI only found about it by accident in 1957. FBI Director J. Edgar Hoover, angered at the invasion of his turf (domestic spying), said nothing publicly but demanded the agency share its findings. A decade later, as student protests against the Vietnam War grew larger and larger, Angleton worked with the FBI to mount Operation CHAOS, which infiltrated the peace movement and surveilled many of its leaders. Angleton was convinced the KGB was inciting the protests with men and money. Still, it was a violation of the CIA’s charter, which prevented the agency from engaging in domestic operations against U.S. citizens. In the wake of the Watergate trials and Nixon’s resignation, Congress began investigating FBI and CIA operations against American dissidents. On December 22, 1974, the New York Times published a story by Seymour Hersh that revealed the CIA’s extensive, illegal domestic spying operations. Angleton was mentioned by name and labeled an “unrelenting cold warrior” who had directed the operations. The CIA was deeply embarrassed by the revelations, and ordered Angleton’s immediate retirement. Morley’s account depicts a deeply troubled man. A chain-smoking workaholic and heavy drinker, Angleton would often arrive at the office at 10 and then retreat for a three-martini lunch. He would often work until two or three a.m. His rarely saw his three young daughters; his wife came close to divorcing him several times. Unlike other senior CIA officers, Angleton never published a memoir. In retirement, he clung to his paranoid suspicions, defending them to former colleagues and to journalists in off-the-record interviews. He died of lung cancer in May 1987, taking most of his secrets with him to the grave. Angleton may have been ghostlike, but the agency he haunted was a highly structured, powerful, organization that reported to the president. Morley’s biography falls short in providing context to Angleton’s rapid rise and sudden fall. Why was he allowed to condemn fellow CIA officers without evidence? Did the presidents he served under know what he was doing? Angleton worked under five different administrations, those of Truman, Eisenhower, Kennedy, Johnson and Ford. But Morley’s book barely mentions these leaders and their different uses of the CIA. While spy agency aficionados will have read recent CIA histories (e.g. Tim Weiner’s Legacy of Ashes), those who are new to the subject may wonder how this eccentric, paranoid man could wield so much power.